Price guide for Beanie Babies that begin with the letter G. If you need pricing for a Beanie Babie that isn’t listed on this page and begins with letter G, leave a comment and I will add it to the list. 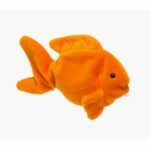 Key Beanie Babies on this page include Goldie the Fish, which can be worth decent money if they have 1st or 2nd Generation Heart Tags. 1st Generation version can easily sell for over $150. Grunt the Razorback’s are worth about $30 if they have 3rd/2nd Generation Tags. Grunt’s with 4th Generation Tags are only worth about $5.